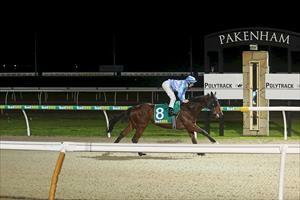 Regally bred Zrinski broke through for her maiden victory with an easy six-length romp at Pakenham on Thursday. The daughter of super sire Redoute's Choice and VRC Oaks star Brazilian Pulse won the 2200m maiden event at her seventh start, after second place finishes at her past two starts. "Luckily she doesn't know who her parents are, but it was important for her owners that she is able to break through for her first win for her future as a broodmare," trainer Danny O'Brien said. "She deserved it as she has been building towards it with strong recent form since she stepped up in trip. "She really loves the synthetic surface and has shown great improvement getting beyond 2000m." Jockey Damian Lane settled the filly last in the four horse field before tracking into the race around the turn and surging away upon straigthening. "She travelled into it so well and she can't do any more than the way she put the race away. It was a nice win," Lane said.